Public Art is much the same as any art out there but with the added condition of being accessible to the public, and lots of times 24/7. It has the power to shape a space and some of the best examples of public art are site specific installations. Sunrise At Woolen Mill Park was my first public art installation and appropriately this achievement occurred in my home town of Warren, Maine in 2010. This panel was created almost entirely with elements salvaged during the demolition of the Georges River Woolen Mill in 2004. In my years the mill was known as Crowe Rope, however, since the mid 1800's the mill was a significant economic engine for Warren and its residents. This property is now public green space and known as Woolen Mill Park. This precise location in the river is a prime spot for photographers and nature lovers to observe the actions of Osprey and Bald Eagles in late spring when the alewives start to run. It was a treat to actually be installing the guardrail and sculpture right at the height of 2010's run. Ridin' the Rails to Rockland ranks right up there with rewarding installations. Being born in Rockland in 1961 and living in Knox County for over 40 years I consider Rockland my back yard. Sandy Beach was a popular spot to enjoy lunch when working in that area and taking in the natural beauty and the harbor with the breakwater and lighthouse. As everyone knows, Rockland has experienced much transition from a working harbor to a cultural destination. Timing was such that much of that transition was right in line with my very own. This sculpture is currently on loan for the city, however, I am patiently trolling for an opportunity to see this sculpture exhibited at this location indefinitely. Wish me luck!! FYI the sections of rail were pulled from discontinued track off of Pleasant Street in 2013, the same year as the installation. I received much help from the City Council and other administrators. Dragon Products contributed funds for a plaque and provided a chunk of limestone that I selected from their quarry to mount the plaque to. This was also appropriate, since Dragon Products is the largest commercial user of the rails. I expect to provide much more information on this project at a later date. Possibly with a blog entry. The paved path running by the sculpture is a section of the Harbor Trail. Ridin' the Rails to Rockland is the inaugural public art installation along the trail. Installation day for A Sprirt of Its Own at Portland International Jetport, April, 2014. A very significant accomplishment here on several fronts. This is part of my limited Shear Ring Series and there will be much written about this series in the future. This raw material was bequeathed to me from friend and mentor David McLaughlin of Liberty, Maine. 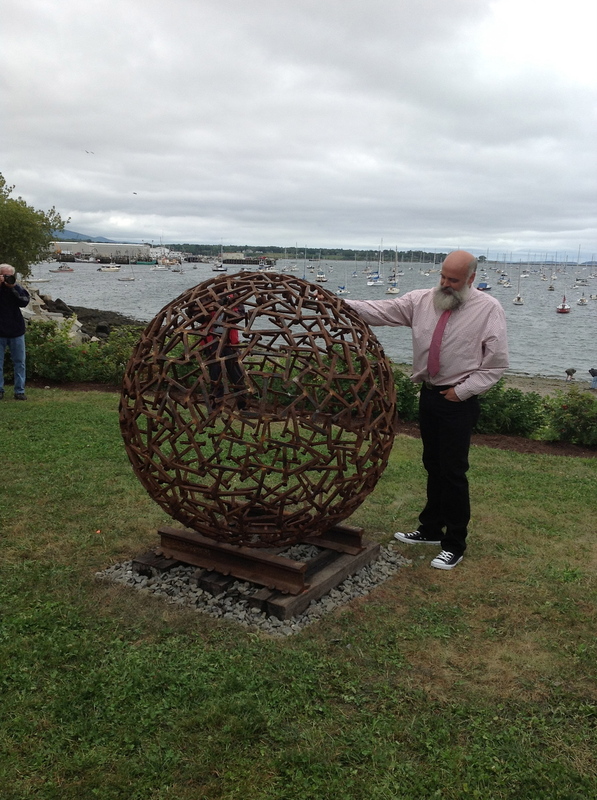 This sculpture allows me to pay tribute to him in a worthy manner for his friendship, influence and thoughtfulness. Simply put, without David this sculpture would not exist.